A major goal of neuroprosthetics is to design artificial limbs that are experienced (‘embodied’) like real limbs. However, despite important technological advances, this goal has not been reached and prosthesis embodiment is still very limited. Differently from our physical body, current bionic limbs do not provide the continuous multisensory feedback required for a limb to be experienced as one’s own. Here, we present a novel neuroprosthetic approach that combines peripheral neurotactile stimulation—inducing tactile sensation on the missing limb—and immersive digital technology—providing visual illumination of the prosthetic hand. We tested whether coherent multisensory visuo-tactile neural stimulation (VTNS)1 induced higher prosthesis embodiment and reduced the distorted perception of the phantom limb (telescoping, ie, the phantom limb is perceived as shorter than the intact limb). Patient 1 and patient 2 are transradial left forearm chronic amputees, who suffered upper limb telescoping. Patients were implanted with transverse intrafascicular multichannel electrodes (TIMEs), which induced the sensation of a vibration in a circumscribed skin region of the finger 2 via medial nerve stimulation in patient 1 (online supplementary figure 1A) and in a skin region of finger 5 via ulnar nerve stimulation in patient 2 (online supplementary figure 1B and material 1). 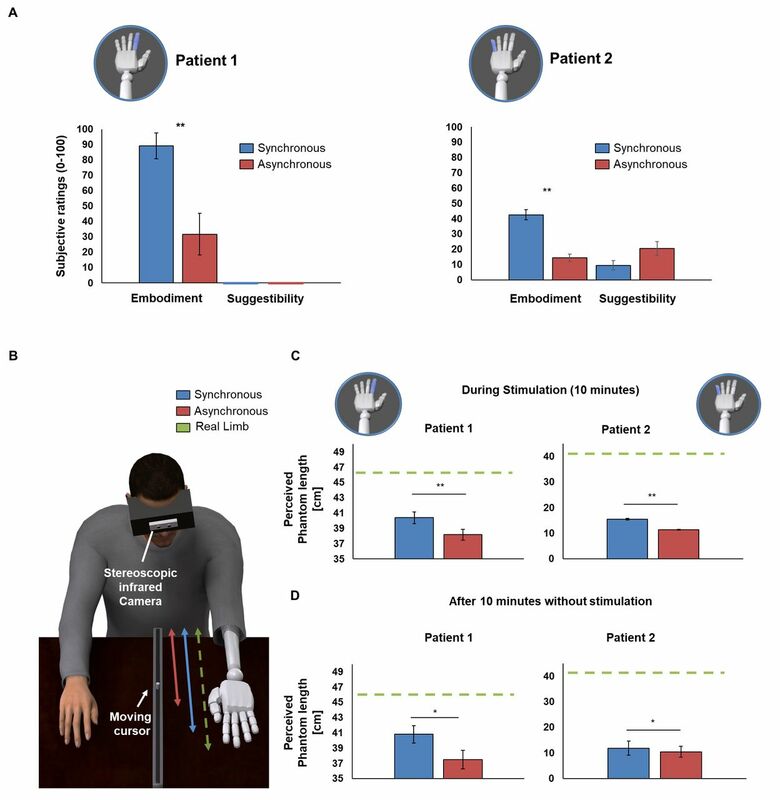 Neurotactile stimulation2 was coupled with automatised visual illumination of a skin region on the patient’s prosthetic hand that corresponded to the somatotopic location of touch sensations experienced on the phantom hand (VTNS; online supplementary video 1, online supplementary figure 1, online supplementary material 1). VTNS was administered in two conditions, either with synchronous visual and neurotactile stimulation or in a control condition of asynchronous stimulation (1.5–2.5s delay).